What better way for all ages to have some cheap fun in the sun than going to the beach? 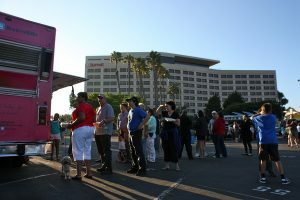 Food trucks offering delicious, low-priced treats is not uncommon, but the summer program Beach Eats at Marina Del Rey is. “We have six to 10 food trucks every Thursday night through the rest of the summer,” said Carol Baker, L.A. County Dept. of Beaches and Harbors. It’s a great way for locals and tourists alike to get out of the house or hotel. Several gourmet food trucks offer savory meals on wheels, while other food trucks dish dine-and-dash desserts in the lot near Mother’s Beach. Parking costs 25 cents every 15 minutes, or a buck an hour, and a waterbus picks up from six other Marina locations for just a dollar each way, and bikes and strollers are welcome. And in addition every other Thursday at Burton Chase park they have a free concert featuring classical music. On those Thursdays there’s a beach shuttle that provides service from neighboring parking lots for free. Marina del Rey is the largest manmade marina in the U.S., offering wide sandy beaches and water sports. Young, old, advanced to novice, all are welcome. “A lot of people can be a little bit timid about trying out different activities, but we have a lot of different facilities in the marina, different instructional courses that make it easy,” said Valerie Arias, Marina del Rey Convention and Visitors Bureau. Beach Eats Thursdays are 5 p.m. to 9 p.m., now until August 30.